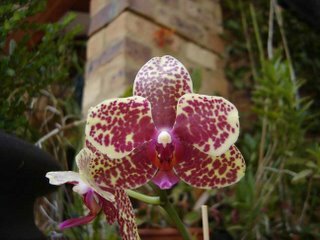 I am happy to report that Phalaenopsis has been my salvation this month - without them there isn't much else flowering at the moment. I'm rather looking forward to the summer blooming season: the Laelia purpurata has three sheaths of developing buds and the Laelia tenebrosa is also looking rather pregnant. Both these plants are grown under shade net next to the house. 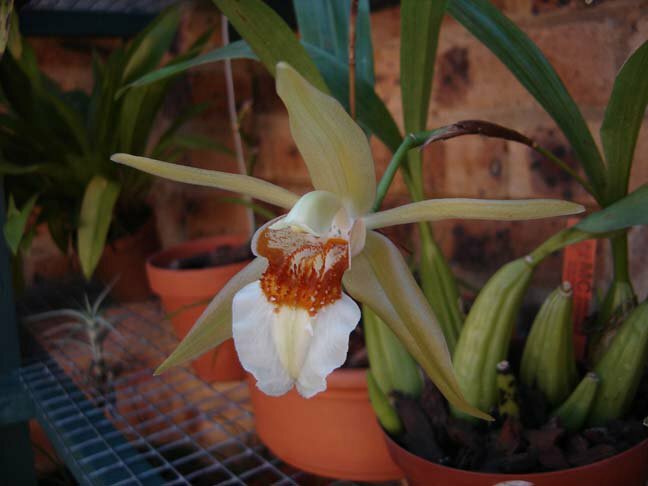 The Phragmipedium Sedenii in the greenhouse is also doing well and its two buds should open quite soon. 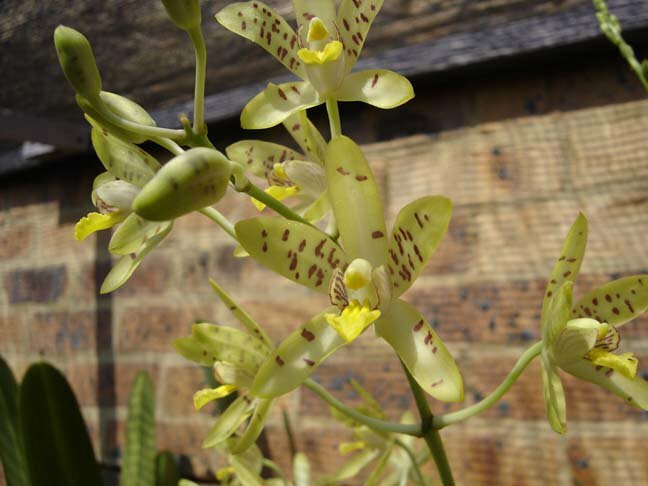 Ansellia africana. The two flowering size plants in my collection are both unnamed varieties, I'd say of the nilotica-group, as they have few brown markings and are rather small. The one with heavier spotting is a propagation from one of the three individuals in the courtyard of the Maths Building, University of Pretoria. The other one is a much more intense yellow and is a division given to me by an aunt. 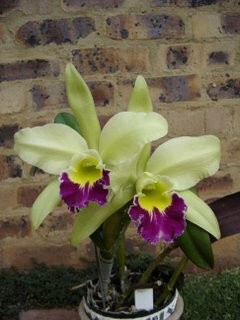 Blc Greenwich. One of my favourite cattleyas. It blooms at least once every 9 months or so and the 15cm flowers emit a strong scent like rose geranium aromatherapy oil, or that's what I'm told. Personally, I think it smells like Turkish delight. Coelogyne lawrenceana. 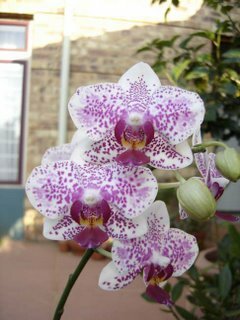 My newest acquisition was bought in bud for R70 from MC Orchids. 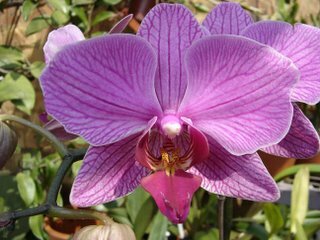 Subtle colours, strong scent and huge flowers for the size of the plant make it well worth it. Dendrobium Black Dragon. This thing is almost impossible to photograph well. There are actually 14 flowers on the spike, all looking exactly like tiny dragons. 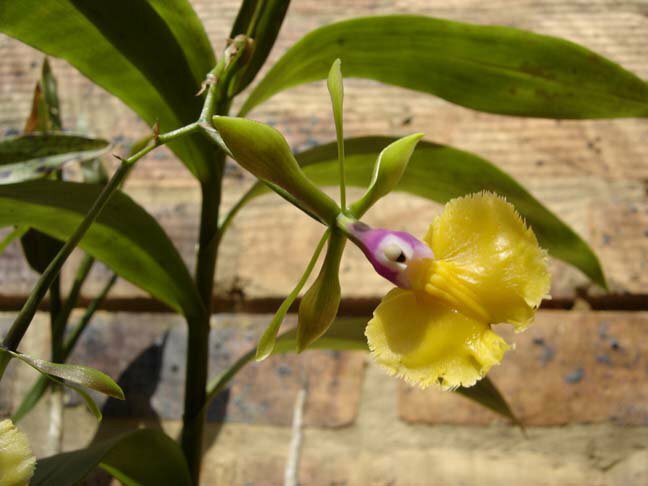 Epidendrum Plastic Doll. 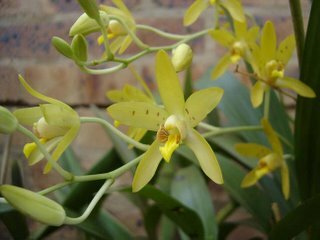 I got this one from Van Rooyen Orchids several years ago. It's a reliable bloomer, just a pity that it only produces one new cane a year! 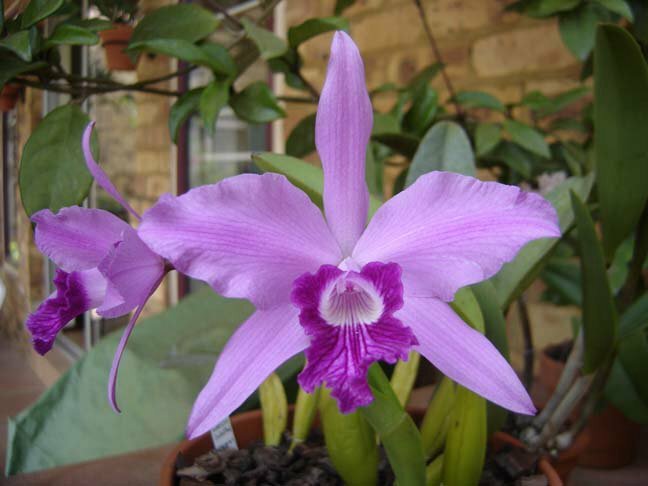 Laelia sincorana x Laelia lobata. This primary hybrid produces the flower stem on the still-immature leading growth, which I think is rather interesting and unusual. 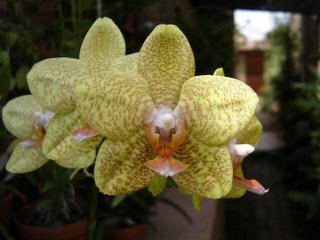 Phalaenopsis Golden Taipei. Huge artificial-looking flowers on a rather small plant. This year it has decided to produce one mutant bloom, with the one underdeveloped petal fused to the column. I don't care what you think, I'm going to blame the hot dry weather. 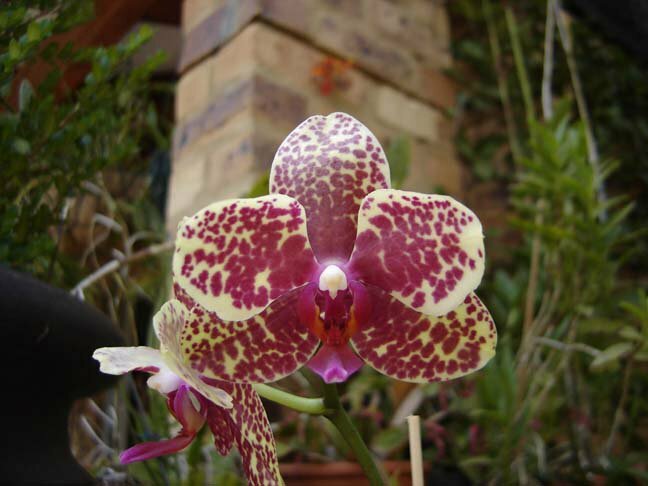 Phalaenopsis Tiffany Coll. A seedling I bought in Pietermaritzburg at the 2003 National Orchid Show. 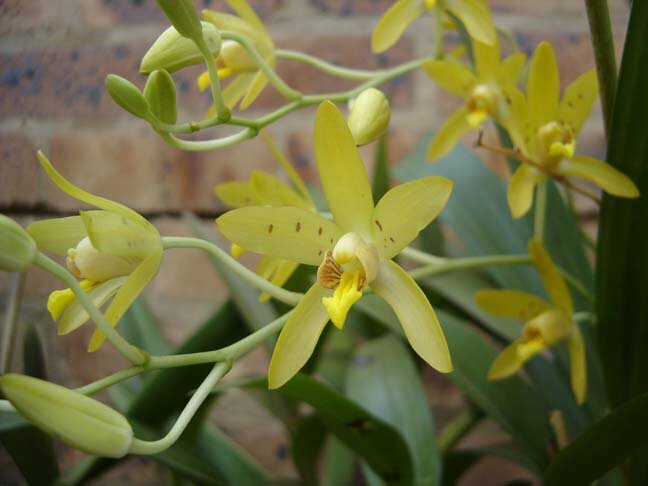 This is its first flowering: five nicely symmetric flowers presented evenly on the spike. I like the concentric circles on the creamy yellow background. Yummy. Phalaenopsis (er, uhm...). A nameless candystripe hybrid I bought at Woolworths for R13,85. The shop attendants were packing fresh potplants on a stand when the whole thing collapsed - I offered to take this phal (now sans massive flower spike) off their hands at a discount. They gave it to me for less 85%! Polystachya ottoniana. 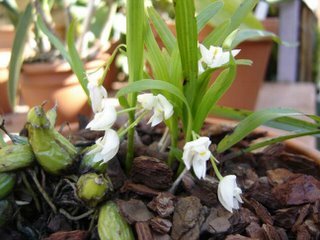 The soft new growth of this indigenous species produces teeny-tiny white flowers resembling those of a non-resupinate Den. kingianum. 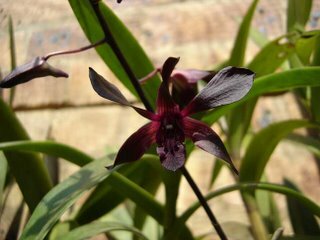 It gives off a powerful cinnamon scent in sunlight. Remember "The Undersea World of Fifi LaFume"?